The Buffalo Bills were recently purchased by Terry Pegula for an NFL record $US1.4 billion. While that is not quite as shocking as Steve Ballmer’s $US2.0 billion purchase of the Los Angeles Clippers, it does shake up how much we thought NFL franchises were worth. Prior to the sale of the Bills, no team had ever been sold for more than the $US1.1 billion Stephen Ross paid for the Miami Dolphins in 2009. 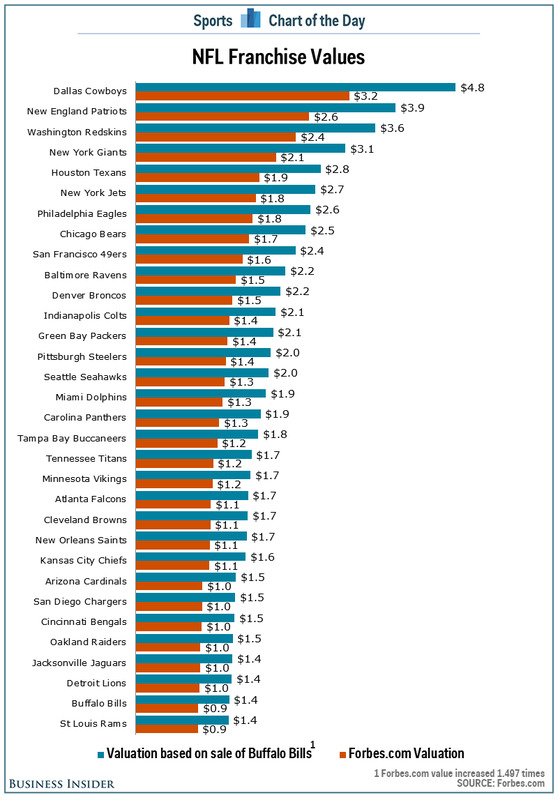 Meanwhile, the Bills are only ranked 31st out of 32 teams in the most recent franchise valuations released by Forbes.com, with a value of $US935 million. How much more? If we raise each team’s Forbes.com value by the same multiple as the Bills’ sale price, which is 1.497 times bigger, the Dallas Cowboys are now worth $US4.8 billion instead of their Forbes.com value of $US3.2 billion (cont. below). Based on that number we wondered if maybe the Cowboys were worth as much as $US8 billion. That felt a little high. But if somebody is willing to pay $US1.4 billion for the Bills in tiny Buffalo, it would not be surprising to think somebody would buy the most popular team in America’s most popular sport for $US4.8 billion. And to think, Jerry Jones purchased the Cowboys for just $US140 million in 1989. Not a bad investment.